Bellflowers are so familiar that there is a tendency to think we know this enduring garden denizen. Campanulas have wormed their way into our gardening hearts and made themselves at home here on the West Coast—but where did they come from? The answer to this question may surprise you. The genus Campanula contains an astonishing 500 species, making it one of the most diverse genera in mass production. 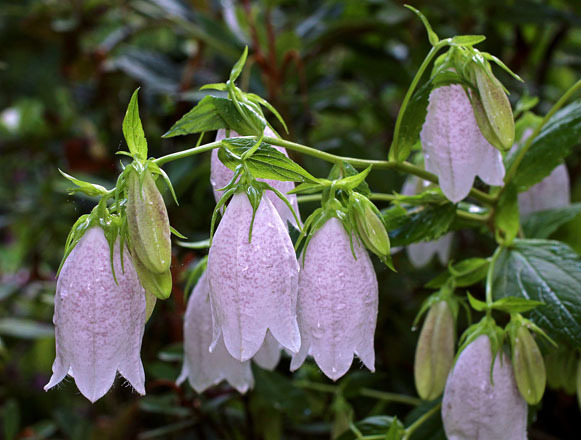 Although the common name, bellflower, suggests tubular flowers, the size and shape of the blooms—as well as those species whose flowers in no way resemble a bell—gives some idea of the diversity of the genus. 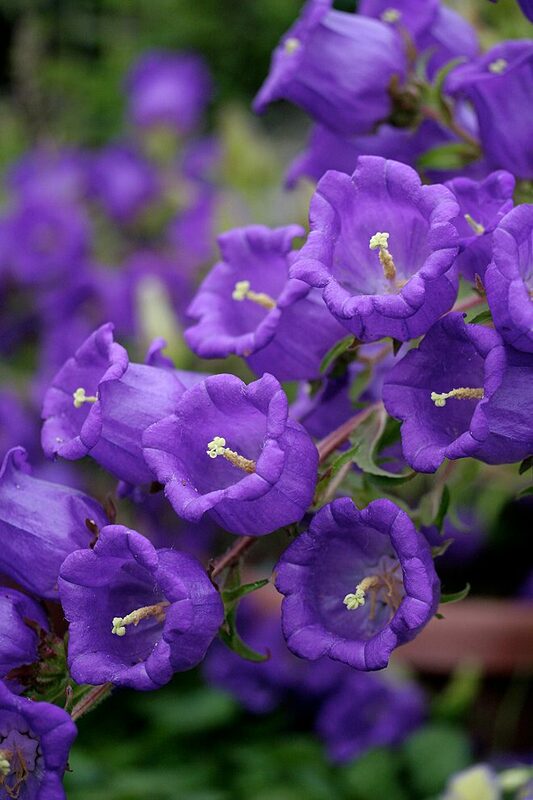 Those with a passing familiarity of campanulas know that many species hail from Europe—which is true, but too simplistic. They are found in high alpine meadows as well as in lowlands, and many are found in Turkey, Croatia, and the Caucasus; there are even species from Greece and the Azores. And that’s not counting those endemic to Western Asia, Japan, Korea, and the Arctic. This is one well-travelled genus. Western Europe is home to many of the taller, sun-loving species. Including a group I call the three P’s. The following species may be planted in stands or used in mixed perennial beds where they provide a vertical accent. Peach-leaved bellflower (Campanula persicifolia), a perennial from the Alps and other European mountains, sports two- to three-inch, open, bell-shaped, purple flowers that flare out in clusters from three-foot-tall vertical stems above a basal clump of slender, shiny, deep-green leaves. Plants can easily fill out a two-foot-wide area and bloom over a long period in summer. The variety ‘Telham Beauty’ offers otherworldly milky-blue flowers. Planted in the garden, Spanish bellflower (Campanula primulifolia) establishes quickly and blooms from late spring to mid summer. Photo: courtesy of Annie’s Annuals. Spanish bellflower (Campanula primulifolia) is one of my favorite sun lovers and also a perennial. A single four-inch start from the nursery quickly produces a bevy of three-foot flowering stems smothered in two-inch, star-shaped, lavender flowers from late spring to mid-summer, much to the delight of hummers and bees. Chimney bellflower (Campanula pyramidalis) is one of the tallest perennial campanulas, easily reaching five to six feet with flowers that are similar to those of C. primulifolia, though the stems are more willowy. 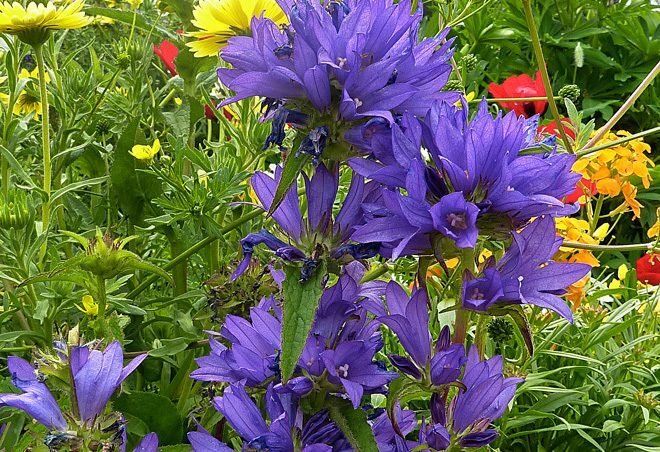 Clustered bellflower (Campanula glomerata) is another sun-lover that earns its common name with terminal, tightly clustered, deep-violet bells. This vigorous, two-foot-high perennial species’ blooms make an excellent cut flower, and removing spent flowering stems encourages reblooming. Scottish harebell (Campanula rotundifolia) is a lower growing perennial species with spindly stems and small, pale-violet, bell-shaped flowers that wave their nodding heads in the breeze. This species prefers to be on the dry side. Just when you think you have a handle on what campanulas are all about, along comes Azorina vidalii, formerly known as Campanula vidalii. 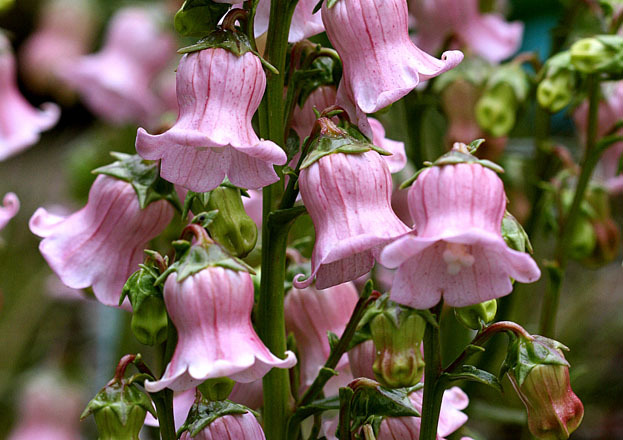 Hailing from the Azores Islands, this unusual bellflower features pretty-in-pink, flared, two-inch bells. The leaves are a distinctive waxy, bright green on plants that grow to 18 inches tall and wide. A biennial, the flowers often don’t appear until year two, but the sea of nodding bells is worth the wait! Two species from southern Europe are familiar to many gardeners and perhaps the most difficult to pronounce! 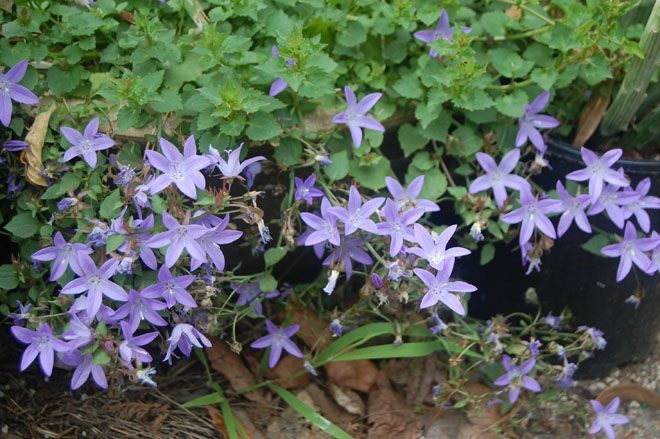 Serbian bellflower (Campanula poscharskyana) is a low-growing, spreading, perennial species with bluish-purple, star-shaped, inch-wide flowers that float above a sea of vivid green foliage. Varieties such as ‘Blue Waterfall’ are ideal selections for rock gardens. Spreading varieties cascade beautifully over a low wall or the edge of a container. 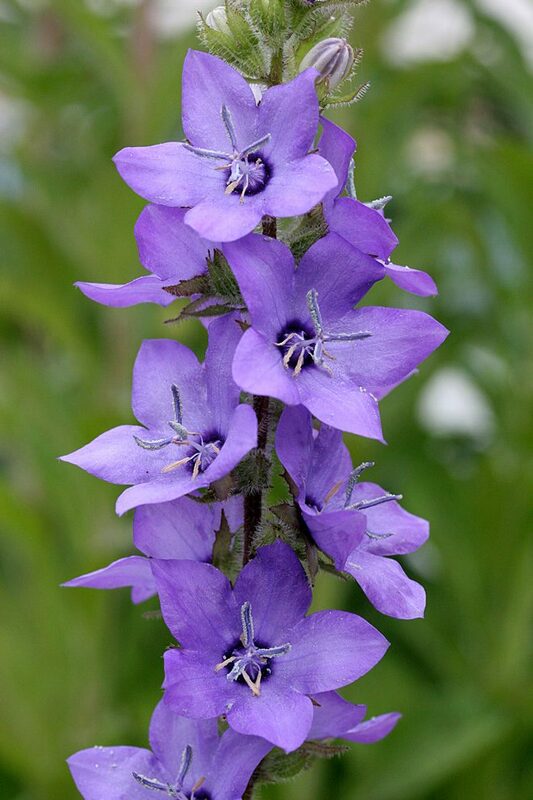 The very similar looking Dalmatian bellflower (Campanula portenschlagiana) blooms from late spring through early autumn, producing abundant clusters of upward-facing, iridescent violet flowers. This perennial is an excellent choice for a hanging basket or container composition. The popular purple or white forms of ‘Birch’s Hybrid’ are a bit more upright, while ‘Muralis’ is a popular ground cover and is readily available in nurseries; both feature heart-shaped, irregularly toothed, inch-wide leaves. In contrast, two other species from this region couldn’t be more different from the above groundcovers. 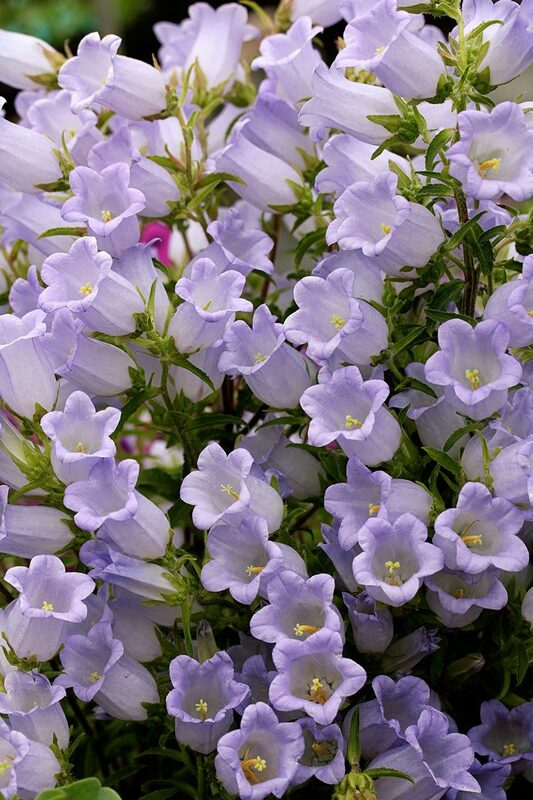 From Greece, the biennial Campanula incurva features large, icy-lavender, bell-shaped flowers on two-year-old plants. Though the plant is monocarpic and dies after blooming, the rosy buds and exquisite flowers are worth it. Milky bellflower (Campanula lactiflora), a perennial species from Turkey, reaches a bushy five feet tall. In mid-summer, the plants are smothered in inch-and-a-half, lightly scented, periwinkle flowers. 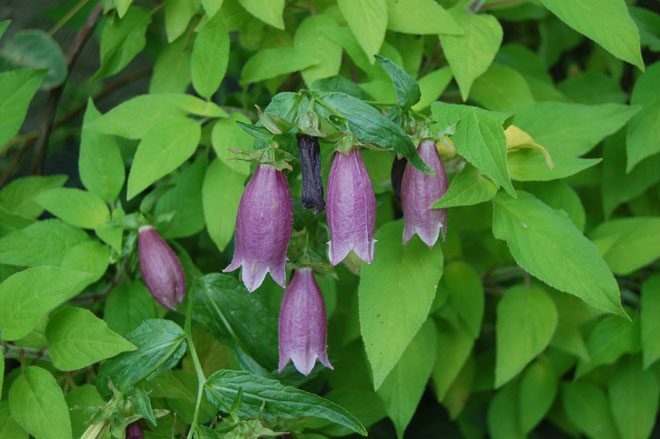 Two outstanding perennial Campanula species hail from Asia, led by the exuberant Campanula punctata. Better known as spotted bellflower due to its speckling, this hardy species is gradually becoming better known in the West. In summer, low rosettes of heart-shaped, green foliage produce multiple flowering stems that sport pink, burgundy, or white nodding bellflowers. A spreading habit makes this plant an excellent choice for a medium-height groundcover. Campanula takesimana from Korea looks similar but has taller, three-foot stems with pale-lilac flowers and dark-purple spotting on the exterior. To my eyes, the speckling on these Asian species makes the flowers look as if they’ve been dusted with pink confectioner’s sugar! 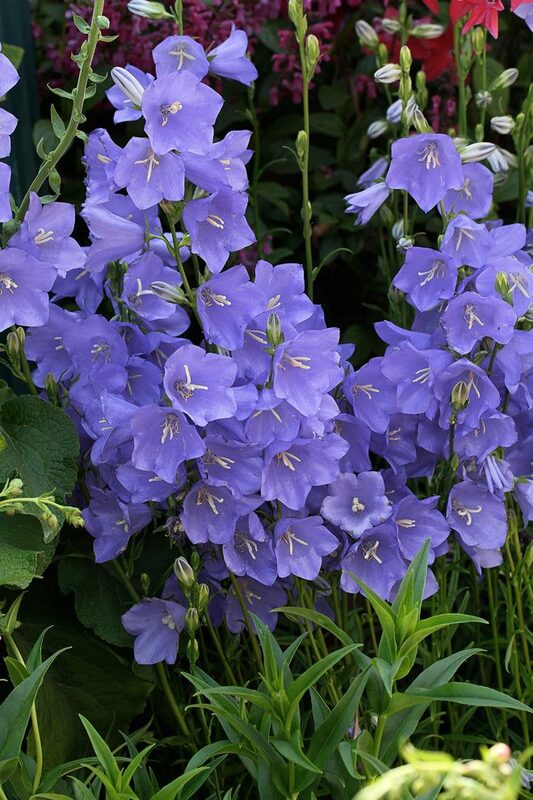 Apart from the common Canterbury bells (Campanula medium), an annual or short-lived perennial in mild climates that has naturalized in both Europe and the United States, there are two minor and difficult-to-find perennial species native to North America. Campanula divaricata, known as Appalachian bellflower and found mostly in that region, produces small bluish-purple bellflowers in late summer. Out West, swamp bellflower (Campanula californica) grows along the coastline between Marin and Mendocino counties. Endemic to marshes and wet forest floors, this rhizomatous perennial produces upward-facing, tulip-shaped flowers that are a lovely pale lilac. There is one Arctic cousin in this genus. Campanula uniflora has a typical alpine habit, growing just three to five inches tall with scrubby foliage and producing pink or purple bell-shaped flowers during the relatively short Artic summer. For fans of the film The Golden Compass, this plant is found in the Svalbard region, a Norwegian archipelago in the Arctic Ocean. 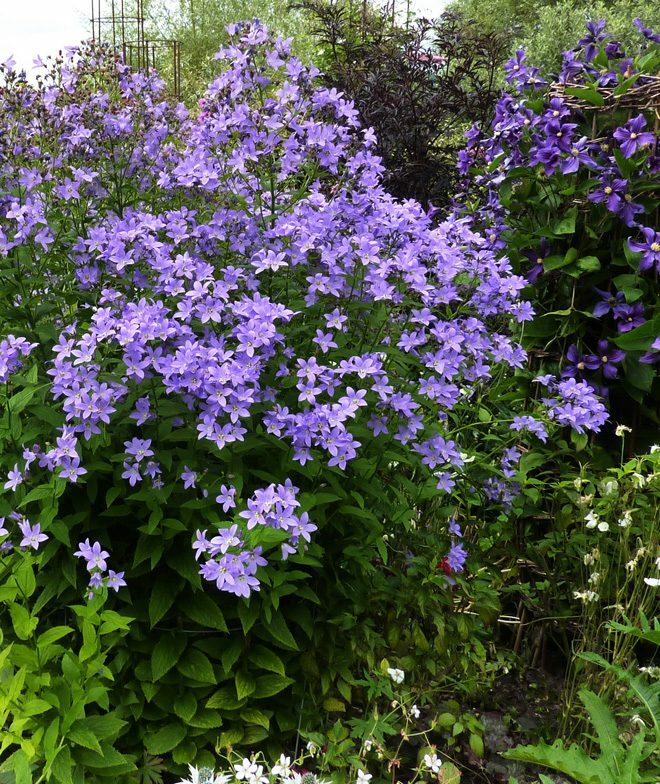 Bellflowers need a good, moist, but well-drained soil with plenty of organic matter mixed in. In cool gardens, plants will tolerate full sun as long as the soil is not dry; in warmer regions, plants prefer partial shade with more shade needed farther south. Bellflowers produce purple, blue, white, or occasionally pink flowers held in small panicles, each with a five-lobed corolla. Situated below them is the calyx, composed of five leaf-like sepals. Certain species have an additional leafy growth, called an appendage, between each sepal. The presence (or absence) of this appendage is often used to delineate one species from another where the appearance is nearly identical. The fruit is a capsule containing a multitude of tiny seeds, allowing mother plants to self-sow. Leaves are primarily alternate and can vary in size on individual plants. Frequent division and transplanting maintain plant vitality. Given the diversity of this genus, readers should consult their local nursery for advice about specific growing conditions and selecting plants that will do well in their garden.